Private betas are great for controlling access to a product as you tweak it. They work best when your product delivers value, but isn’t ready to be used by everyone; either due to scaling issues, lack of documentation, vital features still missing, or whatever reason. If you start talking about your product publicly your potential users will take an interest. You tweet a link, or write a blog post, and they end up at your holding page. Right now they’re interested in what you’re offering, but they can’t do anything about it. So they enter their email address, follow you on Twitter, and then play the waiting game. We’d like to believe that when you invite them or open access, they all jump on board gushing with enthusiasm, but that’s rarely the case. You lost them before you had them. 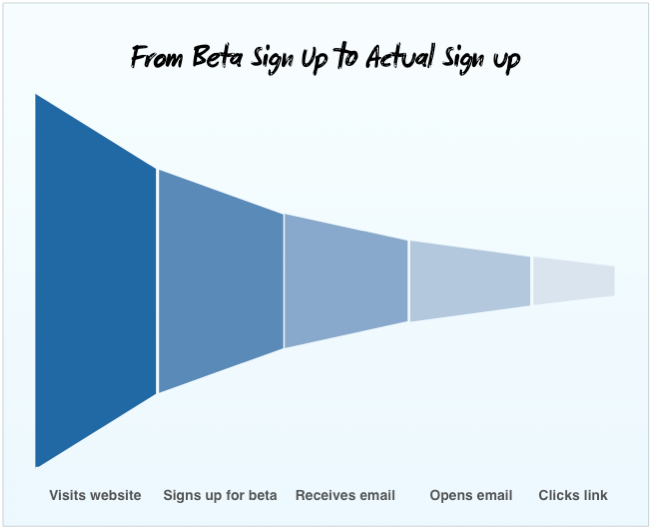 The above shows a very successful funnel for taking users from beta sign-up to actual sign-up. We all like to assume that if a customer signs up, we get a valid email. If we get a valid email address, then our email is received. If it is received, then it is opened by the intended recipient. Lastly, if it is opened, then they click through to return to the site. This is never the case. Beta sign up is incredibly lossy, at every step. The real problem here is that you gathered interest at a time when you couldn’t do anything with it. The above funnel may seem harsh, but I’ve talked to many app owners, and almost all have experienced this attrition of enthusiasm. As the phrase goes, there are few things less common than common sense. All of these tips are no-brainers, but I suspect that email invites are always written in a hurry of enthusiasm and excitement; they rarely get much thought, let alone design. If you’re gathering your potential customers’ names, then use those names in the subject and email body. I’m infinitely more likely to open a Hey Des email than a Dear Customer. During our beta of Intercom, I found that this single change alone increased our open rates by a minimum of 12% and clickthroughs by 15%. If you can’t find names, one easy way to get them is to use Rapportive. 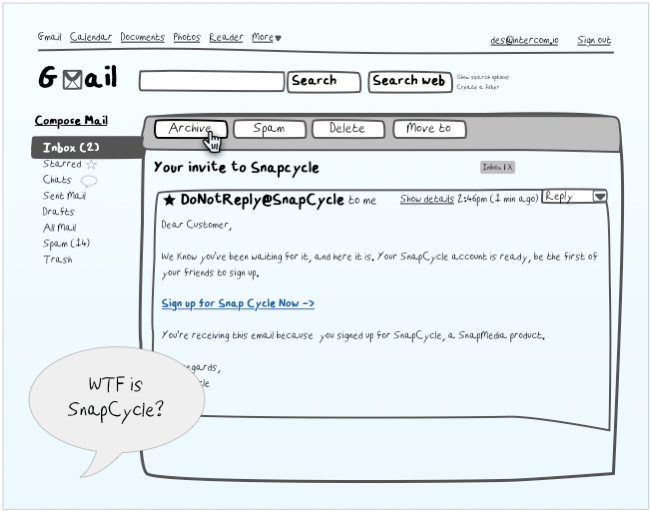 Additionally, some email apps will source them on your behalf. For most start-ups fighting for early users it’s worth taking the extra couple of minutes to source this data. John is stuck in traffic. He decides to illegally browse Twitter to kill his boredom. Someone John doesn’t know retweeted you when you launched your private beta. John gets to your holding page and taps in his email. As he clicks send, the traffic eases and he’s now speeding home, looking forward to watching Monday-night football. Fast-forward two weeks. Do you think John has a clue who the hell you are? No. My favourite example of this is the occasion when I see “Cubic.le has been shutdown and the team has pivoted to NextTo.me“. This loosely translates to me as “Something you never heard of no longer exists so we’ve built something else for you to forget about”. Sometimes you just can’t click Archive hard enough. Explain what your product does, who it’s for, who else is using it, and what the key benefits to using it are. Make it clear what the next step is. For example, if it’s an iPhone app, make it clear you’re taking them to the App Store. If there is a demo mode without sign-up, make that clear too. Screenshots can help too, especially if your interface is unique or remarkable. John is in Fulcrum, one of the cities hottest night clubs. He’s there with Emily, the cute veterinarian he met last week. Emily is at the bar getting drinks so John plays with his phone. He sees four unread emails and against his better judgement decides to take a look, and get rid of them while waiting. Groupon? Archive. Yelp? Archive. Some newsletter he can’t remember signing up for? Archive. And then there’s this other one. It’s from your app. Emily is on her way back with drinks. Have you given him a reason not to archive? The things is you don’t get to choose how John receives your email, and you don’t get to decide whether he even opens it or not. The only think you control is your subject line and the 60 character preview that John sees. These are literally your only weapons against archive. Use it wisely. Your chances of a conversion reduce with each week that passes, unless you’re selling to an existing audience of passionate fans (hint: you’re not). Toward the end of our Intercom beta, we dumped a large (500+) number of invites each day. After analysing those numbers, it’s crystal clear that the less time between sign-up and invite the higher the conversion rate. Intuitively this makes sense. Chances are your product is still fresh in the users mind, they still have the need/desire for the product, and they haven’t found an alternative. Even the most accurate of email metrics can’t detect when it has been read and ignored from the message list. I expect we’ll see a general decline in open rates over the next few years unless someone comes up with some new clever technology. The guys at Mirapost have an interesting technique for measuring engagement time which is a better indicator than open rate, but in a world obsessed with ROI my guess is that email marketers will need to look elsewhere for meaningful data. 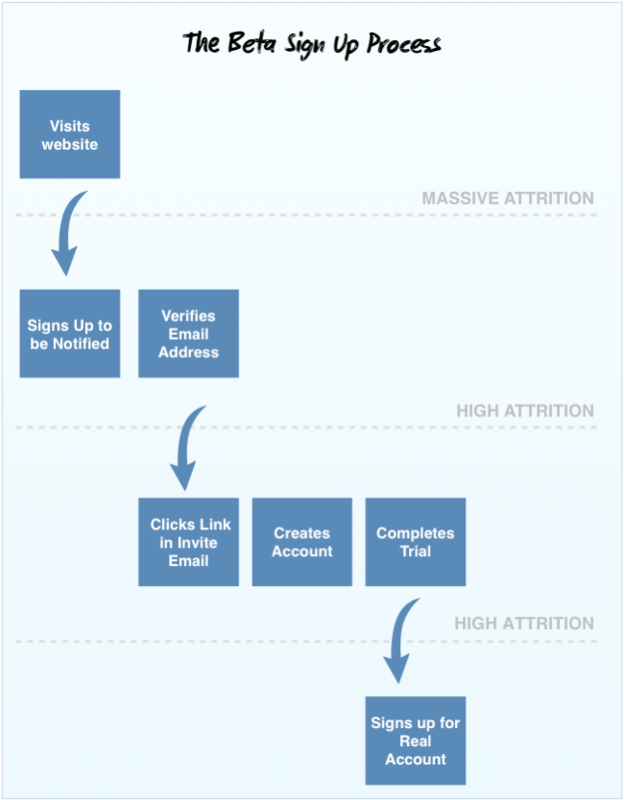 Related: Eric Stromberg has useful advice on increasing engagement in emails. If your product does something new or exciting you have one shot at wowing the world. If all your stories end with qualifiers such as “once the UI get’s tidied up“, or “pretty rough around the edges” then like it or not you’re putting a message out that says “Good technology, poor design”. The press only covers new material. You can’t claim something is new when it has been Dribbbled, blogged and tweeted lots in advance. The chances are everyone who cares has already seen it, so there’s simply no story. If we all had an iPad 3 on our desk with a beta sticker on it, I doubt the press would show to an event where Tim Cook is just going to say “We’re now gonna peel off the stickers. Boom.” Launching, in and of itself, is meaningless to the general public. The less you speak, the more people listen. Android phones launch literally every week, and as a result it’s never interesting. In comparison Apple launches just 2 products per year, sometimes they’re not even especially new, but everyone hears about it. The power of their silence is phenomenal, I can’t understand why other companies haven’t copied it. A private beta requires extra work, and it’s hard to keep quiet about all the great stuff you’re working on, but one of the biggest challenges facing your app is getting publicity. Getting publicity requires a story that is rare, interesting or fresh.